I’ve been a professional plumber for 37 years and have taken the time during those years to investigate, learn and purchase many professional-quality tools to help me do my job more efficiently. One of the tools which I’ve used for thousands of inspections is a sewer line/septic line inspection camera. I know, at just the mention of the words “sewer line inspection” some folks cringe because of what they think (not necessarily what they know). I’ll circle back to that shortly. For now, we’re discussing sewer cameras that are designed to fit into the smaller two to four inch pipes that service residential buildings and connect to city lines or septic systems. They send a live video feed of what’s inside the pipes to a monitor and recording as well. Sewer cameras are not just for plumbers; home inspectors are also finding the service makes sense. “Four years ago, we started offering sewer scope services to our clients. This has been a great revenue stream!” says Michael Wicklund, from The Sterling Inspection Group, who got started using our sewer cameras just a few years ago. Sewer cameras are essential equipment to the accurate detection and diagnosis of piping and draining problems. Diagnosis is fairly straightforward with some basic training from a plumbing professional. No prospective homebuyer is going to move into a new home if they suspect there may be plumbing issues which could cause backups into the house. Consider this: every day that you do not offer customers a pipe inspection, you’re losing substantial revenue & profit opportunity for your business. When offered by a home inspector, this type of inspection takes about 20-30 minutes (total) and sells on average for $195. 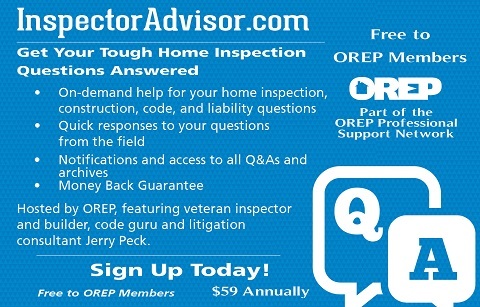 You can learn what you need to know to complete the inspection correctly very quickly. I hope I have your attention! Here’s why you should consider offering this service to clients. Like most plumbers I know, I grew up with a father in the business. Electricians beget electricians, same thing with roofers and factory workers. It was a natural progression for me. I learned from someone who could take time to show me and teach me how things really worked, not just how they looked from the outside. With 33 years in the business, I’ve owned or used virtually every sewer/drain line camera available. Believe me, after that much time you develop a “feel” for your equipment. Over the years I purchased, used and have broken just about every sewer line inspection camera available. I wasn’t trying to break them, I’m protective of my tools and recognized decades ago that if I take care of my tools they’ll take care of me. The issue with sewer inspection cameras is that they just were not holding up under normal demands and too often, when I did have an issue, the entire unit had to be shipped back to the manufacturer for evaluation and repair. That left me dead in the water for doing inspections for literally two to four weeks, which is not acceptable when you’re a plumber and that is one of the primary services you provide. I don’t have anything against imported sewer cameras, I just have a history of them having to be sent back to be repaired much too often. Sometimes sending them back requires shipping out of the country. That hamstrung my business so often I found myself purchasing another camera while one of the units was being repaired. At one point I owned six cameras at the same time. Talk about ridiculous! Plus I had to pay for the repairs as well. It was a true double-whammy. 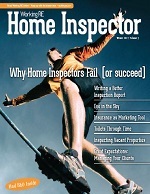 So why am I writing this article about recommending a sewer line camera service for home inspectors? In 2007 I got fed up with my sewer cameras breaking so frequently and decided to build my own which would meet my high standards and expectations! And I proceeded to do so over the next few years and we’ve been selling our system to plumbers now for several years. I was approached by a home inspector in 2015 who wanted to offer sewer and septic line inspections. I thought about it and realized that made pretty good sense because you don’t have to be a licensed plumber to conduct an effective sewer/septic line inspection. I taught him what he needed to know and he started offering and profiting from sewer line inspections the very first week! He taught me about what you do as home inspectors. I starting researching your industry and learned that many of you provide other value-added services to clients such as mold, radon, air quality, water testing and infrared. It confirmed my belief that home inspectors really should be offering their clients a sewer line check in conjunction with the home inspection. I want to help you recognize what to look for, what to expect and what to do to get started with sewer line inspections as a value-added service that should pay for itself within six months! Professional tools are normally more expensive for a reason and everyone reading this understands exactly what I mean. You get what you pay for. There are inexpensive versions of any tool available just like there are cheaper cars, cheaper phones and cheaper washing machine options. If you haven’t picked up on my theme already, quality is one of the key things you are looking for in a sewer camera. Where it’s manufactured should not make a difference but frequently does. How the components are designed matter; are they designed to withstand bumps and bruises? What are the materials used, will they hold up over time, is there a lot of plastic that will break if a wrench or cleanout cap falls on it? Does the design lend itself to easy maintenance and cleaning? Smaller, self-contained units might be lighter weight but in my professional plumber’s opinion they can be much more difficult to maintain and it is easier to kink the pushrod (cable) when sliding the camera into pipes. On the issue of durability, sometimes you’ll need to push the camera into a pipe 100 to 200 feet. With a rugged pushrod design it’ll be tough and stable enough not to kink up (and stop moving forward, potentially damaging the pushrod irreparably). Not all pipes are smooth and straight. You’ll need to put some effort in for the camera to keep moving forward. The pushrod is very important for this to happen consistently and successfully regardless of your customer’s piping type or structures. I’m not saying you need a sewer camera with a pushrod so stiff you can barely coil it back on the carrier. Quite the contrary, a well-designed and built pushrod will feel very solid in your gloved hands while you are pushing it steadily into the pipe. Remember, while you are pushing the inspection camera and the video is being recorded, your attention will be on the screen primarily with a few glances up to the pipe and then back to the monitor. Several different sewer camera systems are being marketed to inspectors now and honestly most wouldn’t pass muster with me. They need to pass muster with you too so let me tell you what you should know before making the purchasing decision. Now I’m a plumber not a home inspector so understand that my advice is based on my three decades of experience dealing up close and personal with plumbing issues of every possible type. Most likely you will only be dealing with primary cleanout accesses and several predictable issues which are known to show up regularly, especially in older homes. Sorry, I couldn’t resist! Here’s more “information” on how to proceed with sewer cameras. 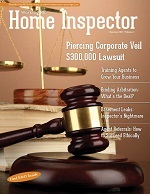 First, you have to decide if adding a sewer/septic line inspection will make sense for your market. How? Research! Take a few minutes to look up plumbers and other service providers in your area who offer sewer line inspections. Give them a call and ask them how much a sewer line visual inspection costs. Be sure to ask what all is involved, what kind of tools are used, how long they think it will take, what they will provide you when they are done (a copy of the video at a minimum along with an invoice of course). And if their ad doesn’t say or mention it, ask them what issues are found most often and the normal cost to repair. You don’t have to tell them why, you’re just doing price shopping and service comparing. Call at least three different folks for comparison information. Next, ask your customers. First, have you already referred customers to plumbers for this service because you think it will be of value to them? You’re already proving the market demand exists! Now, ask several customers whether they’d pay you to do a sewer/septic line visual inspection as a value-added option (and at a much lower cost than a plumber would charge). You’ll receive one of these five answers: “no” ;”yes”; “why?” (do you think there’s a problem, what do you think you might find? ); “maybe, how much will it cost?” (which is another way of saying “yes”); and “isn’t that something a plumber has to do?” Which, again, is another way of saying “yes” once you can answer the question positively. Our research with inspectors over the past several months consistently shows you’ll hear more “yes” than “no” answers. What’s the cost and ROI? OK, so now you’ve heard from several customers who say they would be interested, what’s the next step? Homework! Do your homework; there’s more to learn about sewer cameras than I can squeeze into this article. Here’s the condensed version: current sewer inspection cameras should take advantage of and offer the most current high-tech features. An important quality is versatility. Your camera should be able to do any type of job without difficulty because there is no reason you cannot use this tool to also look up or down chimneys, into other confined space areas, as well as into pipes. It will be waterproof, camera head protected and able to navigate some bumpy terrain. Today’s best sewer cameras offer HD-quality pictures, bright LED lighting around the camera head, durable push cables, battery operation as well as options to identify exactly where in a pipe an issue is identified. And it should be able to record a video of the entire inspection for future review after the camera has been extracted. Expect to see prices range from $1,000 to $15,000 for high end units including accessories. I believe you’ll likely fall into the range of $6,000 to $10,000 for your system once you’ve researched different manufacturers, vendors and customer testimonials. So what’s the expected ROI? Let’s use conservative numbers and say you sell a sewer inspection twice per week for $200. That’s $400/wk. In twelve months or 52 weeks (@$400 per week) that’s $20,800. That’s more than a 200% ROI that should be worth your attention and consideration! One inspector we’ve been working with has used sewer inspections to drive a significant portion of revenue for his firm. “Through November 2016 we did 335 sewer scopes for a total revenue of nearly $73,000. Not only have we increased our sewer scope numbers, but it has also helped us increase our home inspection numbers because agents love our one stop shop business model,” says Michael Wicklund, from The Sterling Inspection Group. I know some are still thinking about the smell and potential for feces in sewer lines. I won’t say you’ll never experience either of these. Though more likely than not where you’ve flushed all the toilets, showers, sinks and drains in the house before opening the cleanout you’re more likely to encounter gray water in “bellies” where pipes have formed a low spot or in physical cracks in pipes. The key to making a sewer line inspection work for you is preparation. I’ve been describing what to look for in the sewer camera. But there are less expensive accessories you’ll need as well like surgical gloves, rags to wipe the pushrod, Lysol or some other disinfectant, a small bucket, a drop cloth and large channel locks. Once you set up your inspection “kit” you’ll be ready to start marketing this service. If I can help answer any questions, please reach out to me directly. I wish you great success adding a sewer line inspection option to your business! Rick Joy grew up in New Jersey and bought his first Roto-Rooter franchise at 22 and built it into a large franchise group before selling his business and moving to Florida. Rick started another franchise with Mr. Rooter which he operated successfully for 24 years. In 2007 Rick started EasyCAM, producing USA-made sewer cameras in Naples, FL. To bring EasyCAM to home inspectors Rick partnered with Monroe Infrared as their exclusive partner to bring the power of value of sewer camera inspections to home inspectors across the country.